Visitors to Newfoundland typically rent cars or bring their own vehicles to the island by ferry. 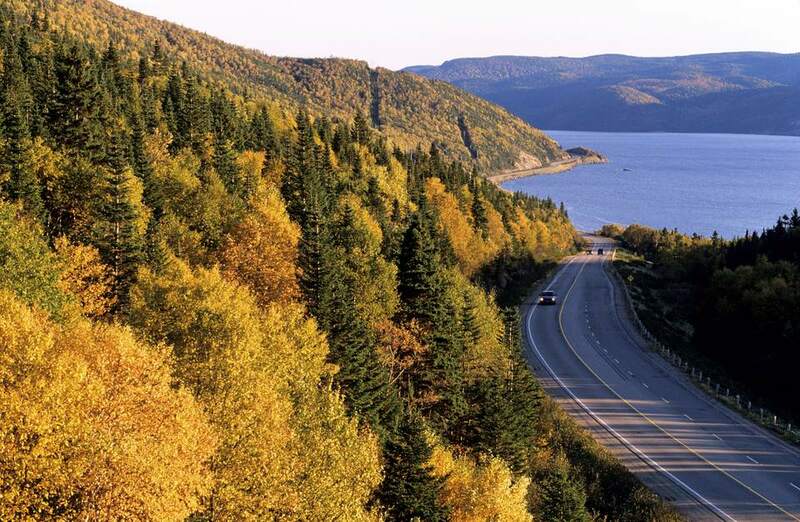 Driving in Newfoundland is not difficult, but there are a few points to keep in mind as you explore this island province. The Trans-Canada Highway (TCH) connects St. John's, the provincial capital, with cities and towns around the island. You can drive all the way to St. Anthony on the tip of the Northern Peninsula using the TCH and regional highways. In general, the TCH is in excellent condition. You will find passing lanes on most uphill grades. Be aware of cross traffic in towns; you will need to slow down as indicated by speed limit signs. Regional highways are in similarly good condition, although they are narrower. Canada uses the metric system, so distances are shown in kilometers. As in the United States, Canadians drive on the right-hand side of the road. Provincial highways usually have two-way traffic and may have potholes and narrow shoulders. Blind driveways are usually indicated by signs. Pass with care. Newfoundland has a "move over" law that requires you to move into the lane to your left and slow down if you pass a car stopped on the side of the road or a first responder or other emergency vehicle. Newfoundland's coastal towns usually sit next to a cove or bay at sea level, but much of the Trans-Canada Highway runs inland. This means that you will be driving up and down hills and may encounter sharp curves. On small coastal roads, you will find twists and turns as well as grades. Newfoundland is an extremely large island with few big cities. Plan your refueling stops so that you do not run out of gas. You will find gas stations in cities, larger towns and occasionally along the Trans-Canada Highway, but there are few places to fill your tank on the road from Rocky Harbour to St. Anthony, the nearest city to L'Anse aux Meadows. You will probably — make that definitely — encounter construction zones if you travel during the summer months. If you do, slow down and obey traffic signs. Allow plenty of time to get from place to place. Newfoundland and Labrador's impaired driving laws are severe. If your blood alcohol level is 0.08 or higher, your car will be impounded for a period of seven to 30 days, depending on your age. Drivers under age 22 may not drink any alcohol if they plan to drive. Do not drive if you are sleepy. Fines for using a cell phone while driving on a Canadian highway are high ($300 and up), so put away your smartphone while you drive. Newfoundland's weather is extremely changeable. This means that you can encounter sunshine, high winds, rain and fog on the same drive. Slow down and turn on your headlights in fog or rain and drive with care in windy areas. During winter months, you are likely to encounter snow. Although the roads are plowed regularly, you should avoid driving in blizzards. Watch for drifting snow and slow down as road conditions warrant. Heed moose warnings. These warnings are not stories designed to scare tourists. Hundreds of drivers collide with moose each year in Newfoundland. Moose are quite large and you are likely to be killed or seriously injured if you hit one while driving. Locals will tell you that there are about 120,000 moose in Newfoundland. Moose tend to wander onto roadways; you could easily round a curve and find one standing in the middle of the Trans-Canada Highway. Do not let down your guard as you drive. You must be constantly aware of your surroundings while driving in Newfoundland, even in remote coastal areas that have few trees. Moose are usually dark brown in color, but some are grayish-brown. They are extremely unpredictable. If you see a moose, slow down (or, better yet, stop your car). Turn on your hazard lights to warn other drivers. Carefully watch the moose. Do not move your car until you are sure it has left the roadway; moose have been known to walk into the forest, turn around, and walk back onto the highway. Should I Learn French to Visit Canada?